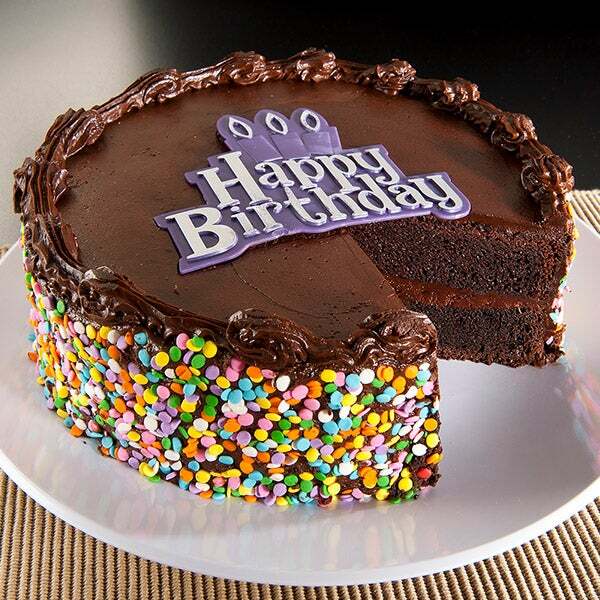 Chocolate Happy Birthday Cake is rated 4.9 out of 5 by 31. Rated 4 out of 5 by Keysony from Who doesn't love chocolate cake! I bought this chocolate birthday cake for my girlfriend's daughter and she absolutely loved it! I'm overseas and it was nice knowing that your company delivered on time! Reliable service! Rated 5 out of 5 by barking B from Chocolate Happy Birthday Cake Absolutely a most wonderful gift for my nephew who is in college. He loved it. Rated 5 out of 5 by Sam47 from GO Cake I bought this cake for my granddaughter's birthday. She said it was delicious! Rated 5 out of 5 by glk3 from Perfect! Very happy with this cake. Arrived on time and tasted delicious! Rated 5 out of 5 by AARON from GREAT SURPRISE GREAT TASTE AND SURPRISED MY SON WHO IS IN COLLEGE. Rated 5 out of 5 by Kateful from Exceeded expectations The cake was delivered on time. It had some kind of cooling mechanism, maybe dry ice, so that it had steam when opened and the cake was cool to the touch. Couldn’t ask for better. Rated 5 out of 5 by G MA from A big hit! Ordered this favorite for granddaughter living across the country since I couldn't bake it myself. Her reaction, DELICIOUS!